Park Hyatt Toronto is one of the best luxury hotels in Toronto located in the heart of trendy Yorkville, one of Canada's most exclusive and expensive shopping district. 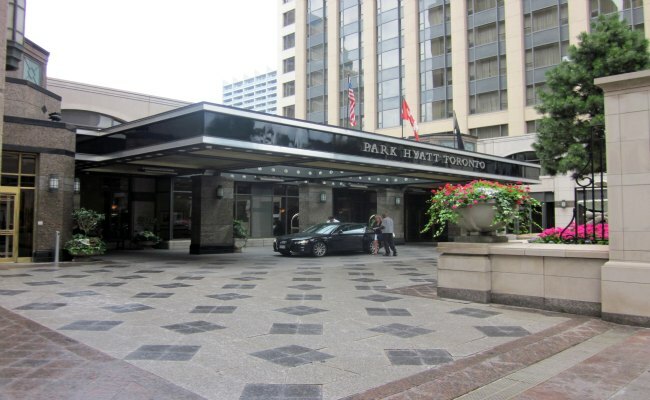 When you check in to Hyatt Toronto, you will be pampered like royalty. Excellent staff and management services, outstanding amenities and facilities, and luxurious rooms and suites - all these you and your family can enjoy to the hilt at the Park Hyatt Toronto. Located at the landmark intersection of Bloor and Avenue Streets, the hotel is within walking distance of virtually many swanky shopping boutiques, gorgeous restaurants and renowned art galleries. The Hyatt Toronto is also just five-minute drive from Toronto's financial and entertainment districts, making it an ideal hotel for business, shopping and leisure travel. The hotel has garnered many of the industry's most prestigious awards. These awards are the testament to Hyatt Toronto's commitment to excellent service for its clientele. And that is a fact you will immediately feel as soon as you step into the lobby and only ends when you want it to be. It is not only the hotel itself that earns the awards. Your trip to the Stillwater Spa located inside the hotel bears witness to its award as one of the Top 10 Best Urban Hotel Spa in the SpaFinder Reader's Choice Awards. Of course, like any other hotel bearing the Hyatt brand, the Hyatt Toronto is judged largely on the quality of its rooms and suites. The hotel offers elegant and comfortable accommodation with well-appointed 346 guest rooms and suites in its two towers. Here you will find city's largest accommodation with rooms averaging 500 square feet. You will most definitely be satisfied, delighted and even awed, by the luxurious accommodations that Park Hyatt hotel Toronto offers to its hundreds of guests. You can enjoy luxury starting with the Park rooms and suites designated as Park King, Park Double, Park Deluxe King, Park Deluxe Double and Park Suite. Your choices in room space range from 350 to 600 square feet with the Park King as the smallest and the Park Suite as the largest in the category. You will find that all the rooms are furnished with luxurious beds with ultra-soft feather duvet bedding while the dining room and mini-bar ensures that you will not go hungry inside your well-appointed room. For a step up into luxury, you must book into the one-bedroom exquisite suites categorized into Luxury and Deluxe. You have more than 900 square feet of space to luxuriate in with suite features like separate entrances for the luxury rooms, which provides for 2 double beds furnished with ultra-soft feather duvet bedding. And then there are the Ambassador, Director, Algonquin and Bi-Level Suites, which the Hyatt Toronto is very proud to offer its guests. If you want unadulterated luxury while in Toronto, the Bi-Level Suites are the best places to find it. You have 1,500 square foot of luxuriously-appointed space featuring a kitchenette, living and dining rooms, and a powder room on the first level while the second level offers the equally deluxe bedrooms. Other amenities in the suites include state-of-the-art DVD/CD stereo system, iHome stereo with iPod docking station, an oversized marble bathroom and working area with Wi-Fi connection. Tip:The hotel has two towers, make sure to ask for a room in the South tower which offers wonderful, uninterrupted view of the city. The Hyatt Toronto houses Stillwater Spa, the best spa in the city. The award winning spa with its 17 treatment room, an aqua therapy room, a couples' massage room, steam room, sauna and whirlpool will soothe your senses, revive your balance and rejuvenate your vitality. After an exhausting day, indulge yourself in well deserved pampering services, including massages, facial and body treatments and salon services. Stillwater Spa is well-known for use of innovative and excellent range of products. Experience the state-of-the-art fitness centre, the StyaFit gym, equipped with an array of latest exercise equipments. The cardio machines are all furnished with personal video and audio services. Park Hyatt Toronto offers overnight valet parking for $38 CAD (plus applicable taxes), which includes in/out privileges. Other major amenities includes currency exchange, complimentary newspaper, same day laundry services, high speed internet - wired and wireless in public areas. Park Hyatt Toronto offers fabulous dining experience with two on-site restaurants. There are also many great restaurants serving lip-smacking food in Yorkville. Tantalize your taste buds with lip-smacking gourmet, international food at the award-winning restaurant Annona. You can enjoy the local, seasonal and traditional favourites at this rich Yorkville restaurant open for breakfast, lunch, afternoon tea, dinner and Sunday brunch - throughout the year. Morton's - The steakhouse is a dazzling restaurant and offers extensive menu which includes succulent cuts of beef, variety of seafood and scrumptious desserts. The Roof Lounge is a sophisticated and intimate bar located on the 18th floor of the hotel. You can relax and enjoy fine wines, signature martinis and good conversations in an elegant atmosphere with an astonishing view of the pulsating city. For a change, you can also try some of the excellent restaurants and bars around the Park Hyatt Toronto. Park Hyatt Toronto offers several high-tech meeting rooms for your business requirements. You can have 24-hour automated access to business center and work stations. The hotel also offers service of fully trained IT professionals, if need arises. Additionally, this Yorkville Toronto hotel offers the best in audiovisual equipment. You can also take advantage of office supplies, computers and printers, fax machines, packing and shipping (FedEx, UPS), photocopying and typing services. With Park Hyatt Toronto's enviable locations, there are numerous activities that you can enjoy during your stay in the city. The Park Hyatt Toronto is within easy walking distance of upscale shopping establishments, distinguished museums and renowned art galleries in the area. The hotel is just few minutes away from one of the world's posh retail neighbourhoods. With over 200 posh fashion, jewellery, beauty and accessories shops, you will find that the Bloor-Yorkville is the creme of the international shopping arena. The Hazelton Lanes is another ritzy shopping complex offering world-class luxury brands, also famous for celebrity sighting. Some of Canada's top museums - Royal Ontario Museum, Bata Shoe Museum, Gardiner Museum are all just few metres away from the hotel.